I am hooked! I've become a fan of the Philadelphia Union. Now a season ticketholder I must say I enjoy each and every game from the non-stop action, the quality of the Union team, the fantastic PPL park venue, to the Sons of Ben fan club. First, PPL Park. 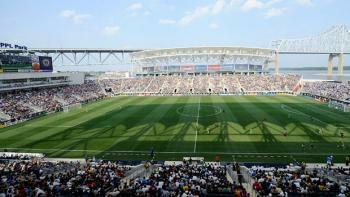 An amazing venue opened in 2010 for the Philadelphia Union. I am amazed that the team has only existed and played since 2010. The Union organization is top notch and the venue is the best in the league (note: I am biased of course). Located in Chester the new 95 off ramps to the stadium make it easier to enter and exit the stadium. 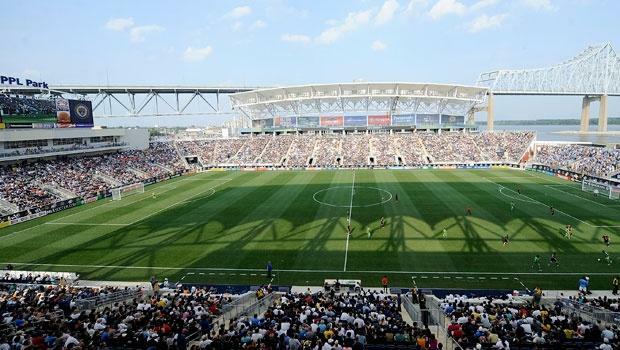 PPL Park is situated on the Delaware in Chester, and while we can be overheard saying "why isn't this stadium in Philadelphia with all the other stadiums", it's still a great site and pretty easy to get to. Second to none, The Fans: Hands down the Philadelphia Union fans are the best fans around. When they score the stadium erupts like no other stadium. When the referees make a mistake, the crowd let's them know it. It has been fun to get to know all the other "regulars" who sit around us and sincerely appreciate them teaching me the in and outs of the game. Third, The Sons of Ben: One of the largest and most active fan clubs in the league, the Sons of Ben members take up a whole section of the stadium and keep the crowd entertained and excited. I would not want to be an opposing team member facing the Sons of Ben, but we are Philadelphia and not known for our quiet sports demeanor. Fourth, Soccer: Soccer is non-stop exciting action and I am thrilled to see the sport taking off in the United States and of course, Philadelphia. I love the sport and look forward to a great season. See you at PPL Park.